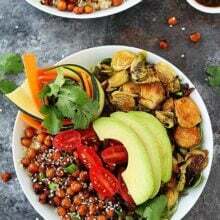 Korean BBQ Chickpea Bowls make a great healthy lunch or dinner! 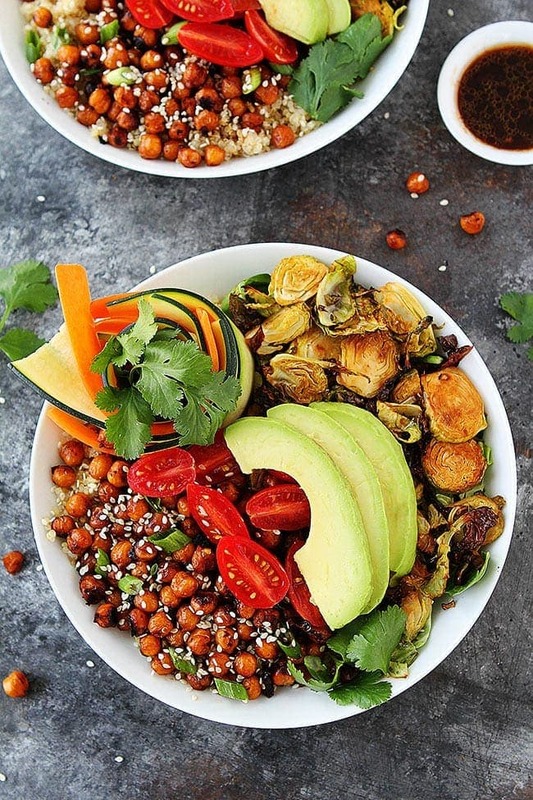 The bowls are loaded with roasted chickpeas and lots of delicious and colorful vegetables. You will love this quick and easy meal! I am currently obsessed with meal bowls. You know a meal that fits in a bowl. They are kind of trendy right now and I am usually not a trendy person because I can never keep up, I am more of a classic kind of gal, you should see my closet, it is mostly black..ha! BUT this is one trend I can completely get behind. 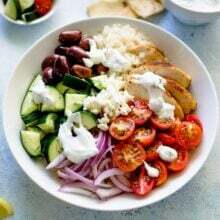 I am all about a meal in one bowl, especially when that bowl is filled with delicious goodness! I love a bowl that is filled with ALL of the things! Last week, I made Korean BBQ Chickpea Bowls and they are my new favorite lunch. Oh, and Josh loved them too! We had a lunch date at home and I am telling you, they were better than any bowl we could have gotten at a restaurant. Lunch dates at home are the way to go, especially when bowls are involved. This bowl recipe comes from my friend Lindsay’s new cookbook, Nourishing SuperFood Bowls. The book is GORGEOUS and filled with 75 healthy bowl recipes that are all gluten-free and packed with superfoods! There are bowls for breakfast, lunch, dinner, and even dessert! I can’t wait to work my way through the entire cookbook, especially after eating these chickpea bowls! They are SO good! Roasted chickpeas are one of my favorite foods and I love this Korean BBQ version. The chickpeas are super tasty, especially with all of the veggies. I am all about loading on the veggies. I roast the Brussels sprouts with the chickpeas because I like my Brussels sprouts nice and crispy. You could also shred them and eat them raw if you wish. The bowls also have zucchini and carrot ribbons, I know, fancy! Don’t worry, they are easy to make with a vegetable peeler or mandoline. And if you don’t want to make the ribbons, you can make zucchini noodles or carrot noodles. They would be pretty too! I use quinoa for the base of the bowls, but rice would work well too or even cauliflower rice. You could also use a bed of greens as the base of the bowls. Garnish the bowls with fresh cilantro, green onions, tomatoes avocado slices, and sesame seeds. Bowl meals are super customizable so feel free to add your favorite veggies and toppings! And you can style the bowls however you want! Get creative and enjoy every bite of this colorful and healthy bowl. The bowls are great for lunch or dinner. I can’t wait to make them again! 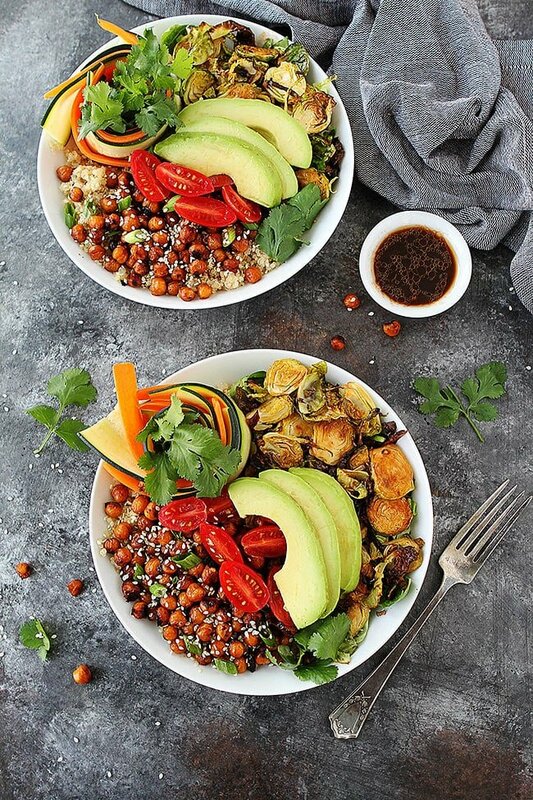 Make sure you check out Nourishing SuperFood Bowls for more delicious bowl recipes! 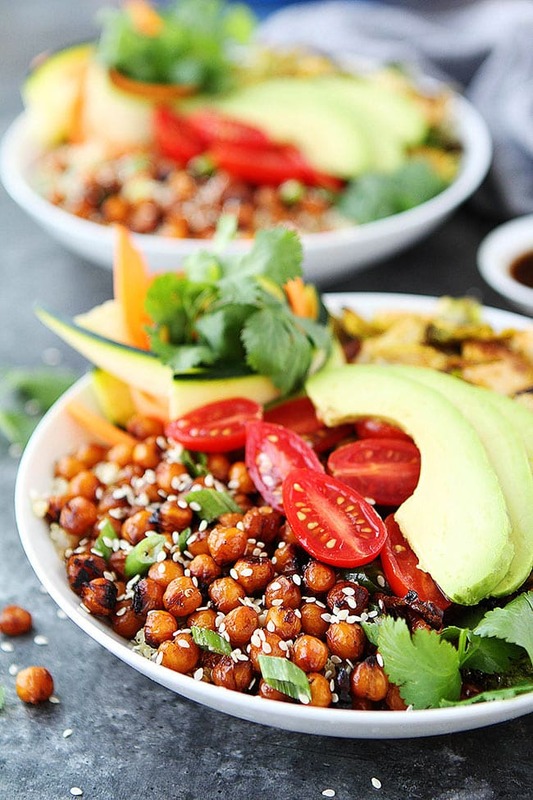 You will love these easy and healthy chickpea bowls! They are great for lunch or dinner! Preheat the oven to 400 degrees F. Line a large baking sheet with foil. To make the Korean BBQ marinade, combine the tamari, water, tomato sauce, honey, ginger, pepper, garlic, sesame oil, and green onion in a medium bowl. Add the chickpeas to the marinade bowl and toss until chickpeas are well coated. Reserve 2 tablespoons of the marinade for topping the bowl. 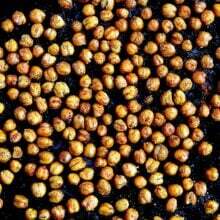 Spread out the chickpea mixture on the prepared baking sheet. Add the Brussels sprouts Roast for 30 minutes, turning once, until the chickpeas and Brussels sprouts are crispy. Remove from the oven and set aside. For the bowls, divide the quinoa or rice into bowls. Top with chickpeas, Brussels sprouts, zucchini, carrot, tomatoes, and avocado slices. 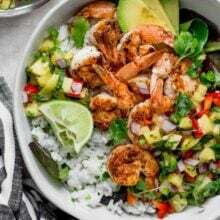 Garnish the bowls with lime juice, sesame seeds, cilantro, crushed red pepper flakes, salt, and pepper. Serve immediately. This looks so delicious! Great for when you need a lot of veggies. Thanks for sharing. Oh thank you friend! I am so glad you enjoyed the bowls and I love the quinoa here. So pretty! thank you for a very creative way for me to get these ingredients into one dish, all of these ingredients are pretty nutritious but don’t like eating a lot of them plain and hadn’t come up with a recipe to fit them all! Roasted Korean BBQ chickpeas?! AHHH NEED THESE! Lovely dish and what I particularly admire is the lovely BBQ color of the chickpeas! 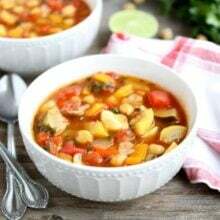 I would love to try this recipe, but wanted to ask if I could use raw chickpeas and boil them to use in your recipe instead of using canned ones? They would still taste the same in the recipe, isn’t that right? Since the canned ones are also boiled. Yes, you can use raw chickpeas if you prefer them! Enjoy! Easy to make and a huge portion! I used half the quinoa suggested and that was plenty. A little time consuming to chop everything up (took me about an hour to make the recipe) but worth it! Will make this again. Another great recipe from two peas and their pod!